Hike the lava strewn slopes of Sicily's brooding Mount Etna, Europe's largest volcano, 3323 metres above sea level. Hop by boat between the tiny Aeolian Islands and climb their volcanic cones which rise, sometimes smoking, out of an intensely turquoise sea. The accommodation for the first four nights of your holiday is in the main town of Lipari on the island of the same name. It's easy to catch public buses from here to access a variety of walking options on the island and boats depart frequently from Lipari harbour to neighbouring islands. Lipari has a reputation as the liveliest in the Aeolian Islands! You can visit the old fortress, stroll around the local fish market or sit and enjoy good food, wine and music in a bistro in the ancient harbour of Marina Vecchia. If you are arriving into Catania airport today you should aim to arrive no later than 12:30 hours to give yourself sufficient time to reach Milazzo harbour before the last hydrofoil to Lipari at 18:30 hours. Over the next three days you'll have the chance to enjoy a variety of walks around the island of Lipari, which is the largest of the UNESCO World Heritage listed Aeolian Islands. It's your choice as to which ones you fancy and which day you'd like to do them. Today you might like to take a walk to the southern tip of the island and to Mount Guardia starting from the port. This varied walk will give you fantastic views of the coast and on a clear day you can see Vulcano Island. You'll walk firstly to an astronomical observatory overlooking Vulcano and also the rugged cliffs and the rocky sea stacks of Faraglioni. On the second section of the walk you'll descend to the old town centre of Lipari, with its beautiful historic architecture. Alternatively you may choose a shorter walk from one beach to another - Acquacalda to Canneto. To start the walk you'll need to take the local bus from Lipari to Acquacalda. The walk will take you through the evergreen vegetation of the Mediterranean scrub and on your way you'll see pumice caves and get to enjoy magnificent views on the surrounding islands. Some of the best views can be found at the panoramic point at 346 metres above sea level. The walk descends to Canneto, the most famous beach on Lipari Island, where you can enjoy a refreshing swim before taking the local bus back to Lipari town. The Mount Guardia walk is almost 11.5 kilometes and expected to take around five hours with an ascent and descent of 560 metres. The Acquacalda to Canneto walk is five-and-a-half kilometres and will take you around one-and-a-half to two hours with an ascent and descent of 380 metres. Today you may like to take a walk from Quattropani along the western coast of the island, which is the wildest part of Lipari and gives you the sense of plunging into a true wilderness. 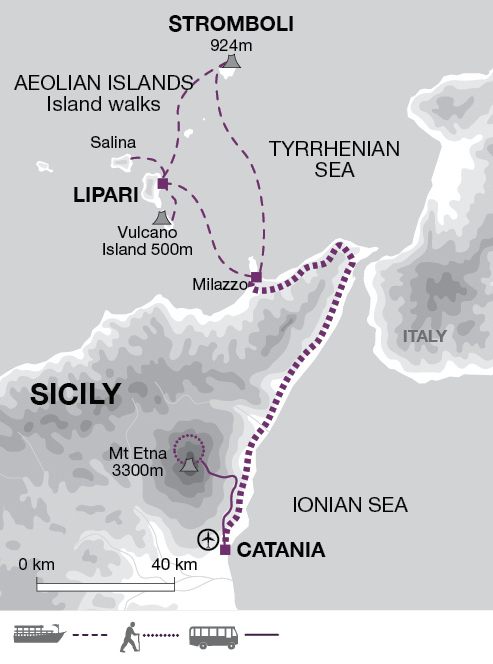 To start the walk you'll need to take the local bus from Lipari to Quattropani. After enjoying some magnificent land and sea views along the way you'll reach the San Calogero Thermal Baths, dating back to the Mycenaean period and thought to be the oldest spa in the Mediterranean. You can then walk back to Lipari town through pretty villages and past steaming volcanic fumaroles. An alternative option is to take a boat over to the island of Vulcano to take a walk to the Gran Cratere. Vulcano is a small, but spectacular island and the most southerly in the Aeolian chain. You can walk up through an almost lunar landscape to the Gran Cratere 'the great crater', which constantly emits a yellowish smoke, which colours the surrounding ground due to its sulphurous steam. From the top you have an exceptional 360 degree view of the island and the volcanic archipelago beyond. The descent along green slopes gives you an amazing contrast of colours against the blue sea and the dark grey rocks. The Lipari to Quattropani walk is 13.5 kilometres and will take you around four-and-a-half to five hours with an ascent of 500 metres and descent of 800 metres. The hike up Gran Cratere on Vulcano island is just under six-and-a-half kilometres and will take you around two-and-a-half hours with an ascent and descent of 370 metres. Today you may like to take a short hydrofoil ride from Lipari to Salina Island. Salina is unlike the other nearby islands as it has a lush landscape of wildflowers, woodland and hillsides covered by vineyards. Once on the island you can take a local bus to Semaforo di Pollara where you can see an abandoned lighthouse high on the clifftop. From here you can walk along the western coast. It is a demanding climb with some steep ascents and descents, but your efforts will be rewarded with amazing views of the Filicudi and Alicudi Islands. The walk ends in the village of Rinella from where you can take a bus back to the main port of Salina. The walk on Salina is seven-and-a-half kilometres and expected to take you two-and-a- half to three hours with an ascent of 405 metres and descent of 655 metres. Today you'll take the boat to Stromboli Island. On arrival at the port in Stromboli your main luggage will be taken and transferred to your hotel leaving you free to stroll through the narrow whitewashed streets. The walking on Stromboli is a one of a kind and a spectacular experience as the volcano here is constantly erupting. There are two options for the walk on Stromboli depending on your walking ability.You may choose to take a circular walk to 272 metres above sea level to see the lava flow field called the 'Sciara di Fuoco'. This walk is suitable for all abilities and it's rare for the route to be inaccessible due to volcanic conditions. Alternatively, you may decide to take a more strenuous walk, which involves climbing to the top of Mount Stromboli at 924 metres above sea level. It is is only possible to do this climb if you are accompanied by an authorised volcanologist as part of a guided group walk. This walk starts in the late afternoon, so that you reach the top in time for sunset. You'll stop here for a while as the darkness offers the best chance to observe the light show caused by the lava erupting volcano. The descent is at night, so you will need to bring a torch, as there are no public street lights on the island. The top section of the climb and descent of the mountain is on volcanic ash so it's important to have good walking boots and you may find walking poles helpful too. Please note that this walk may be restricted or cancelled at short notice due to volcanic activity or bad weather. As the top of Mount Stromboli is restricted to 80 visitors per day and demand can be high, Explore's partner in Italy, S-Cape Travel, will have provisionally booked you a space on this group walk and for which there is a cost of €30.00 per person payable locally. You will need to confirm with the company offering this walk beforehand if you wish to take part and details of how to do this will be in the trip route notes, provided a few weeks before you travel. The Stromboli to Sciara del Fuoco walk is just under eight-and-half kilometres and will take you around two-and-a- half hours with and ascent and descent of 325 metres. the Stromboli summit walk is 14 kilometres and takes around six hours with and ascent and descent of 1000 metres. Today you need to make your way from Stromboli to Milazzo Port by hydrofoil or ferry boat and then take a local train or bus to Catania. Full details are provided in the trip destination manual which you receive a few weeks before travel. You then have the whole afternoon free to explore this beautiful and lively city. You may like to visit the cathedral or the ancient Benedictine monastery, which is a jewel of Sicilian Baroque architecture. If the weather is hot, we recommend trying 'granita', a local specialty made up of shaved ice and fruity syrup accompanied by a delicious brioche pastry. This morning after breakfast a taxi transfer takes you to Piano Provenzana, where you'll discover majestic Mount Etna on a guided walking trip. The walk will take you up the slopes of the volcano slopes, walking amongst recent lava flows, caves and lush vegetation. You'll enjoy a picnic of local produce along the way. You are brought back to your hotel at the end of the day where you can enjoy a final evening in Catania. Today's walk is 10 kilometres and expected to take around four-and-a-half to five hours with an ascent and descent of 450 metres. The group will have a maximum of 8 walkers of potentially mixed nationalities and will be guided in English and maybe one other language, depending on the make-up of the group. Excursion to the top of Mount Stromboli - €30.00+ €3.00 tax per person. You will need light layers of clothing for walking during the day and a fleece and waterproof jacket as temperatures can drop on the mountains. A sunhat is essential and bring a swimming costume if you wish to bathe in the sea. We recommend you bring walking boots - leather or fabric are both fine. Some of the paths are a bit rocky underfoot and so you could twist an ankle if not wearing boots. Trainers are not recommended. Make sure that your boots are worn-in and comfortable before the start of the trip. We recommend that you wear/carry your walking boots as hand luggage on the international flight; should your luggage be delayed, your well broken-in boots will be irreplaceable. Bring trainers and sandals for relaxing and other sightseeing. You will need one main piece of baggage and a daypack sufficiently large enough to take everything needed for your walking day, such as your water bottle, snacks, spare clothing and camera. A luggage transfer is included between the port of Stromboli and the Stromboli hotel on your arrival and departure on the island. This transfer is provided by the hotel that will have a 4-wheeled 'Ape' tuc-tuc with the hotel name waiting for you at the port. On all other occasions you will take your own luggage with you. Included between the port of Stromboli and the Stromboli hotel on your arrival and departure on the island. This transfer is provided by the hotel that will have a 4-wheeled 'Ape' tuc-tuc with the hotel name waiting for you at the port. On all other occasions you will take your own luggage with you. You should bring a two litre water bottle, sunhat, sunglasses and sunscreen. Trekking poles are recommended. A local city tax is required to be paid in cash upon check-in to each accommodation - approximately 3 Euros per person per night. You should aim to arrive into Catania airport no later than 12:30 hours to give yourself sufficient time to reach Milazzo harbour before the last hydrofoil to Lipari at 18:30 hours. For this trip you can fly into and back from Catania 'Fontanarossa' airport. From Catania airport, the easiset option to to get to the port at Milazzo is to travel by private shuttle bus service which must be booked in advance (www.eolianshuttle.tarnav.it). You can also take a bus or train. Milazzo is the port from where the ferries for the Aeolian Islands depart. Trains to Milazzo all travel via the city of Messina and depart from Catania Centrale train station.For uptodate train schedules check the Trenitalia website (www.trenitalia.com).To get to the train station from the airport you can take either a taxi or the AMT Alibus. From Milazzo train station (Piazza della Repubblica) you can take a Giuntabus or AST bus to Milazzo Port. Buses to Milazzo all travel via the city of Messina. From the airport to Messina you can take an Autolinee bus and from Messina to Milazzo Port a Giuntabus. You will need to make sure you reach Milazzo by 1830 hours so that you are in time to catch the last hydrofoil (or ferry) to Lipari. From Milazzo Port you can board a hydrofoil operated by Ustica Lines or Siremar or a ferry boat operated by Siremar or N.G.I. to Lipari. For your departure on day 8 you can take an AMT Alibus service from Catania Central Station or Catania city centre to Catania airport. Visas are not required by UK citizens. Other nationalities should consult their local embassy or consular office. Due to the volcanic dust and sulphur fumes from the volcanic mountains, we ask asthma sufferers or customers with heart conditions of any kind to take these factors into consideration when deciding if this holiday is right for you. 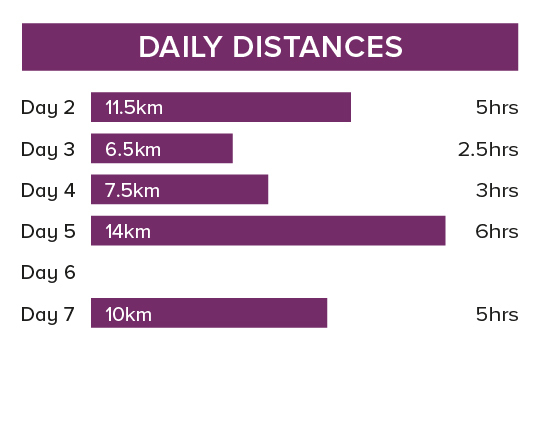 On this holiday the total distance walked will depend on which daily options you chose to take, with walks ranging from 5.5 to 14 kilometres. Much of the terrain in these volcanic landscapes will be rocky with some loose scree. The most difficult walk, the Stromboli summit ascent (from sea level to 924m) is an optional guided group walk. The included day spent walking on Mount Etna is also part of a guided small group. There are no technically difficult sections nor scrambling required. Mon 1 Apr 2019 - Sat 27 Apr 2019 Your trip can depart anytime between the above dates. Contact us for triple room requests and solo traveller prices. Sun 28 Apr 2019 - Sat 25 May 2019 Your trip can depart anytime between the above dates. Contact us for triple room requests and solo traveller prices. Sun 26 May 2019 - Tue 11 Jun 2019 Your trip can depart anytime between the above dates. Contact us for triple room requests and solo traveller prices. Wed 12 Jun 2019 - Thu 27 Jun 2019 Your trip can depart anytime between the above dates. Contact us for triple room requests and solo traveller prices. Fri 28 Jun 2019 - Thu 25 Jul 2019 Your trip can depart anytime between the above dates. Contact us for triple room requests and solo traveller prices. Sun 25 Aug 2019 - Sat 31 Aug 2019 Your trip can depart anytime between the above dates. Contact us for triple room requests and solo traveller prices. Sun 1 Sep 2019 - Sun 15 Sep 2019 Your trip can depart anytime between the above dates. Contact us for triple room requests and solo traveller prices. Wed 1 Apr 2020 - Mon 27 Apr 2020 Your trip can depart anytime between the above dates. Contact us for triple room requests and solo traveller prices. Tue 28 Apr 2020 - Mon 25 May 2020 Your trip can depart anytime between the above dates. Contact us for triple room requests and solo traveller prices. Tue 26 May 2020 - Thu 11 Jun 2020 Your trip can depart anytime between the above dates. Contact us for triple room requests and solo traveller prices. Fri 12 Jun 2020 - Sat 27 Jun 2020 Your trip can depart anytime between the above dates. Contact us for triple room requests and solo traveller prices. Sun 28 Jun 2020 - Sat 25 Jul 2020 Your trip can depart anytime between the above dates. Contact us for triple room requests and solo traveller prices. Tue 25 Aug 2020 - Mon 31 Aug 2020 Your trip can depart anytime between the above dates. Contact us for triple room requests and solo traveller prices. Tue 1 Sep 2020 - Tue 15 Sep 2020 Your trip can depart anytime between the above dates. Contact us for triple room requests and solo traveller prices. Wed 16 Sep 2020 - Wed 30 Sep 2020 Your trip can depart anytime between the above dates. Contact us for triple room requests and solo traveller prices.